Hard-bottom shellfish beds are locations where a shellfish species occupies more than 50% of an area of more than a few square meters. Five species of shellfish occur in San Francisco Bay: native Olympia oysters, California mussels, hybridized Bay mussels, and non-native ribbed horsemussel and green bagmussels (the latter two are not considered in this report). 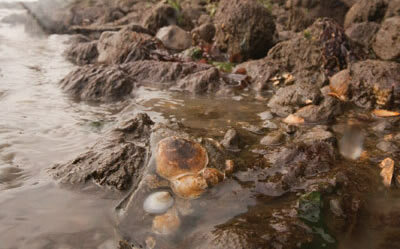 Small populations of the non-native Pacific oyster are found in the South Bay, where eradication efforts are underway. The Olympia oyster is the most abundant and the only species that is a native confined to estuaries. Numerous individuals have been found on hard substrates in the Central Bay and to a lesser extent in San Pablo and the South Bays. 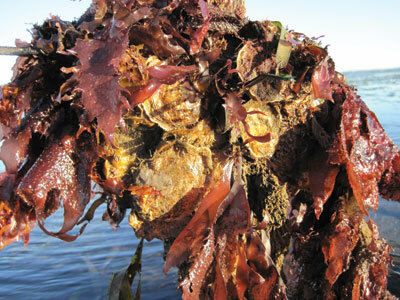 Native oysters are threatened by high rates of sedimentation and extended periods of low salinity. Human-induced threats include water pollution, boating, shipping, and dredging, which can disrupt oyster beds or cause sediment to smother the beds. The Subtidal Goals Project recommends building upon the demonstration oyster restoration work that has been performed to date, and moving toward larger-scaled pilot projects while focusing on knowledge gained in the process (adaptive management). Goals for shellfish beds include protecting existing native oyster beds, creating and enhancing additional beds, and improving scientific understanding of ecosystem services, factors influencing the beds, and restoration methods. To read more, download the shellfish beds section of our report.